Electric Micrometers provide accurate readings on tight wire. They are used together with wire alignment brackets. Head set features volume control for distinct contact tone. Set is adjustable from 3 ½” to 12” with adaptor for ½” stainless steel tubing extensions from 12” and longer. 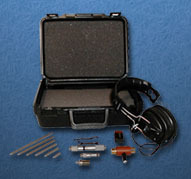 Electronic micrometers are wire alignment tools. They are sold in wire alignment kits. They are turbine alignment equipment used in turbine assembly and turbine alignment applications. Wire alignment brackets, weights and wires are sold separately. Some keywords are turbine alignment supply, steam turbine alignment, electronic micrometer kit, electric micrometer.